Here are some requirements when deciding on a SCADA system. A key requirement of a SCADA System is the ability to connect with devices and systems. Having all existing protocols, including outdated protocols, is overkill and inefficient. Best if the ability to connect to the used devices in the current project is available. Communication must be fast, preferably with built-in drivers, and easy to configure. Most crucial requirement of a SCADA system. Problems must be made known when it arises. For manned systems, visible and audible alarms are high priority. Additional SMS and emails alarms are preferred as well. 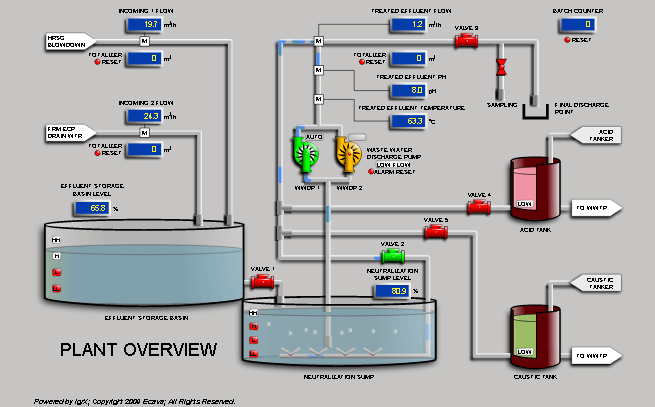 SCADA systems must have the ability to customize visualization to represent the unique processes and systems of each and every plant or process. Graphics must be flexible enough to draw to requirement, fast to load in the viewer and yet looks good. Every SCADA system must now be web based. The ability to use a standard browser on any device from any location to connect and view the SCADA system is an refuted advantage. Best if the client’s browsers do not need to install additional plug-ins or software. Ecava IGX Standard aims to address your SCADA system needs. I/O counts start from 32, 64, 128,… up to 4096. IGX SCADA System has device drivers for more than 80% of the devices in the market including Modbus, OPC, Profinet, Ethernet/IP, FINS and BACnet. Also a driver to connect to a SQL-based database like a device. This allows mix and match of native protocols with fast communication. Alarms notification included. Trending charts included. Graphics and animation included. User management with password included. Developer tools included. All these key features are included in our IGX Standard SCADA system runtime license. IGX Standard is a flexible SCADA system built for WEB. Use a standard web browser on mobile phones, tablets and PCs to connect and view. Remote clients can be added to the standard runtime license at a very low price. Ecava IGX SCADA is a web responsive SCADA system. SVG is the de facto standard for Web Graphics. Text and vector-based allows for fast and lightweight transfer across the web. Powerful and easy-to-draw stunning visualization graphics with SCADA animation will impress you and the end-user. SCADA systems are complex software but they don’t have to be difficult. You can trial Ecava IGX Standard SCADA system with your devices before purchasing. Our standard demo is for 2 hours, you can extend the demo period to 7 (seven) days to fully test the system for a small price of USD 4.99 (DEMO+).